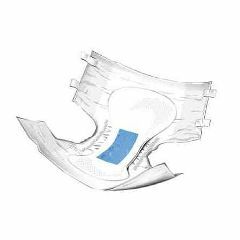 AllegroMedical.com presents The StayDry Ultra Breathable Adult Briefs - Heavy Absorbancy. StayDry Ultra Breathable briefs by McKesson. These maximum protection adult diapers provide the protection you need with the comfort you want. They feature a premium acquisition layer which quickly wicks fluids away from skin and the the ultra absorbent core locks fluids safely in place. They also reduce pH of urine for improved odor control and skin wellness. The inner and outer material is a soft cloth-like material that is both quiet and very comfortable against the skin. The breathable side panels allow air to circulate to keep skin drier and healthier. A perfect fit every time is ensured by soft hook and loop tabs that can be fastened anywhere on the brief. Depndable. Comfortable. Truly reusable straps. I started getting these more than 6 months ago after I tried a few of the other brands. Since my Mom resides in a personal care home, I listen to the aides that care for her as to how the products I purchase are performing for her. They all said that these are the best for her night incontinence. They are comfortable, easy to use, the reusable straps are, well, reusable which makes changing her easy. very comfortable. keeps you very dry. This is a great product. It keeps you cool and dry even through the night. fastners stick and restic. fastners stick and restic.